Shiritori Game is an English version of the Japanese word game Shiritori. Shiritori (しりとり) is also called "Word Chain" in English. It's a simple game where players take turns to choose a word that must start with the last letter of the previous word. In this version, points are scored by using longer words and answering quickly. The game is intended both for native English speakers and learners. It can be played to improve English vocabulary and spelling, or just for fun. You can play either single player against the A.I or multiplayer with a friend. 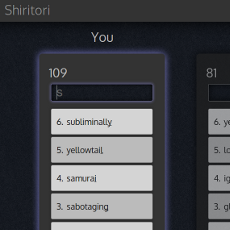 Shiritori Game is a static site generated with Middleman, using HAML, SASS and Compass. The game is implemented in HTML5, CSS3 and CoffeeScript with no server-side code. Multiplayer games are kept in sync using the awesome Firebase. The design is responsive, meaning it can be played on desktop, tablet or smartphone.